Thanks to artists such as Meshuggah, Periphery, and Tesseract, the parameters of what is progressive metal continually evolves over time. Modern progressive metal incorporates djent, stutter-step rhythm elements as well as technology/cyber-keyboard swirls to differentiate itself from an older Fates Warning/ Dream Theater-oriented model that places primary focus on advanced musicianship and organic interplay. Italian quartet Hypnotheticall (there’s a moniker safe from stealing) seat themselves in the former platform based on this third full-length Synchreality – the title taking on an imaginative mirror of cyber-space that reflects reality. After a few spins, these ten tracks possess an intriguing mixture of heavy, low-tuned guitar hooks, spacious keyboard parts to enhance the atmosphere, plus driving tempos and a solid mid-range oriented vocal presence that could gain Hyponotheticall a decent cross-section of metal and progressive music aficionados. The explosive mini-runs and heads down, staccato-oriented riffs for guitarist Giuseppe Azula become infectious against the versatile, tempo juggling and grooves from drummer Giulio Cariolato – check out “Where All the Trees Bend” and “Industrial Memories” for their intuitive, push and pull drive that makes both cuts standouts. A second half left-field entry comes in the form of “In Hatred”, its sparse keyboard/drum programming nature against an emotionally-driven vocal performance from Davide Pellichero more in line with late 80’s Depeche Mode than anything metal – but it provides that necessary differentiation to spark the next progressive movement. Hypnotheticall never succumb to the trappings of overindulgence – which can put people off due to self-serving intricacies. You will get separate, well-thought out ideas converted into succinct, four to five-minute plus arrangements that have a purpose, and that’s where comparisons to Periphery and Textures may abound – although the vocals veer more into an alternative/modern rock meets Threshold mid-range delivery. And most will enjoy the spirited acoustic details that close out “Analog Dream Experience” – Giuseppe amply demonstrating his training and theory skill sets through some addictive runs on this instrumental. 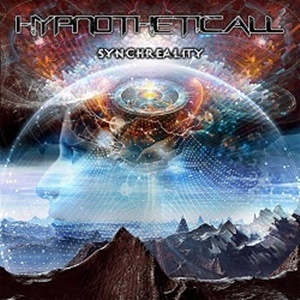 Davide’s Italian accented English does come through at times to make from some uneasy phrasing (the verses of “Rumors” a prominent example with the background vocal shoutouts), but in the end the complete modern progressive metal package Synchreality offers gives Hypnotheticall a solid leg up to compete with some of the leaders in the genre. This could be one of the hidden gems of 2018.